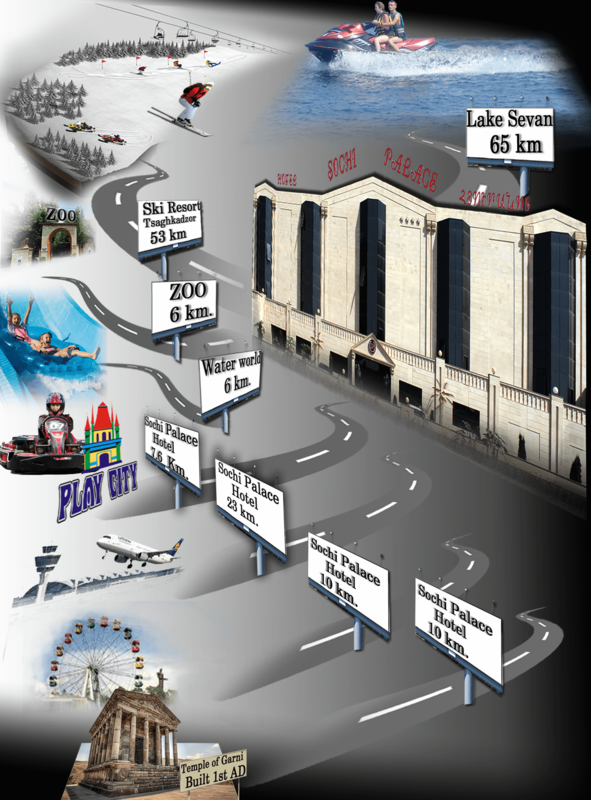 Here You can get familiar with some of things to do in Armenia and about our hotel. Looking forward to welcome you soon here to see-and-be-seen. .
Sochi Palace Hotel is situated not far from the city center of the capital Yerevan, Armenia. Sochi Palace Hotel in Armenia is a new opened 4 star hotel complex with an original design, various services, and a welcoming staff. Sochi Palace is a unique hotel in Armenia and astonishes travelers with Extra large apartment-like-rooms. You want to socialize? Then lounge bar is your place because most of the time it’s crowded with tourists and local people. Sochi Palace Hotel’s Restaurant holds its reputation on high level among restaurants in Yerevan in a result of hard work of our professional cookers and its large hall with modern furnishing, lightening, stage, and a high quality service. What makes us stand out from other hotels in Armenia is our extraordinary Sauna club, which services for multifunctional entertainments. Another part of the complex is the Billiard Club and Fitness Club. There is a large general billiard hall for groups, and three separate VIP billiard halls. The fitness center is full of modern equipments to keep you fit and have an active rest. One of the most important parts of the hotel is the Tourism department where you can organize different types of tours in Armenia order tour packages.